(Newser) – Grilled lamb has become a scapegoat for Beijing's notorious air pollution, Reuters finds. Authorities say they have destroyed more than 500 open-air barbecues, which they claim seriously affects the city's air quality. State media showed photos of workers cutting apart the grills, many of which are operated by migrants from Xinjiang. They probably got the idea from Kalifornia's fruitcakes. San Francisco has chimney spies who report people using fireplaces on "no fireplace days." Not unlike Toquamada's chimney watchers during the Spanish Inquisition when a non-smoking chimney on the Sabbarth was an indication that a Jewish family was observing the Sabbath restrictions regarding building a fire to cook, and they could be persecuted. They had to start powering down the factories three months before the Olympics. It was not easy to do as compensation had to be arranged and party officials had to be greased. Naturally workers were not compensated but in China, its a communist country already so you will get your allotment of government owned commodity food such as rice, grains, and beans as long as you are in good standing with the party. Think of it as the Democrats handing out that stuff at their party headquarters as long as you turn in your absentee ballots to them at election time. 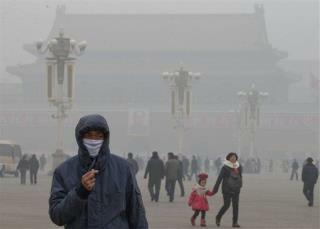 So the Olympic cities were still smoked in during the Olympics and that shamed China to some extent. Then one of our Olympic coaches was murdered right out in the open and China just said, "Well, our people get killed in the USA so its not such a bad thing." So the games are over and most of the media had gone back home to have non-dog and non-cat Chinese food for a change. Then the cities all fogged in real good as the smelters and factories went back on line. Why did that happen. Easy, Chinese factories do not use costly scrubbers or electrostatic precipitators like is used across the USA. How many fumes does a Chinese tank emit?